Home > Shop by Brand > Pinnacle Natural Brilliance > Pinnacle Engine Cleaner & Degreaser - 128 oz. Pinnacle Engine Cleaner & Degreaser - 128 oz. Safe for metal, plastic, and rubber. The key to a cleaner engine! Pinnacle Engine Cleaner & Degreaser is an advanced formula of cleaning agents and degreaser properties designed to detail the last mile; your engine bay. This special blend of cleaners loosens the grip of grease and breaks down the grime that have invaded your engine bay with minimal effort. Pinnacle wanted to make sure that it was just as safe as it was effective. Utilizing a formula that is phosphate and solvent free, Pinnacle Engine Cleaner & Degreaser is safe for all the common materials found under the modern vehicle hood like metal, plastic, and rubber. Ask any detailer, the engine bay is one of most difficult areas on a car to clean. This deep pit of contamination presents a few different challenges. With grease lurking in every tight space and a diverse collection of different materials to clean, it can be overwhelming. This is why using the right tool for the job is crucial. You wouldn�t want to scrub a tire with a toothbrush and you won�t want to clean another engine bay again without Pinnacle Engine Cleaner & Degreaser! Under your hood you�ll find some of the toughest contamination known to detailers. Grease, grime, and oil just to name a few. This is an uphill battle for most products so finding the correct one for the job is essential. Pinnacle Engine Cleaner & Degreasers special blend of cleaning agents easily breaks down grease and grime, even in those hard to reach areas! To the Pinnacle chemist, creating a safe formula was essential. Under the hood of a modern car you�ll find an array of different materials like metal, plastic, and rubber. Let�s face it, trying to use multiple cleaners in such a condensed space isn�t ideal. 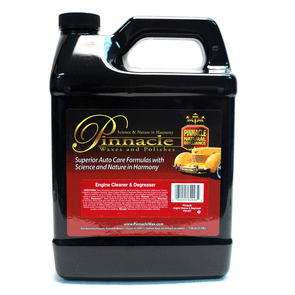 Therefore, Pinnacle Engine Cleaner & Degreaser was made phosphate and solvent free. This makes it possible to clean all the different materials under the hood without the worry of discoloring plastics or staining metals. Let product dwell on the surface for up 5 minutes. For heavy contamination, use a medium bristled brush to agitate. Rinse clean using a gentle spray of water.